Okay, I was curious about the Golden Pepperoncini used to make the 4 BEAN BISON CHILI. So I looked it up on Wiki and here’s what I found. The friggitello (plural friggitelli) is a sweet Italian chili pepper of the species Capsicum annuum. It is also known as the Golden Greek pepper, Sweet Italian pepper, or Tuscan pepper. In the United States they may be called “pepperoncini”; they are quite distinct from Italian peperoncini, which are hot Italian chili peppers. The friggitello is mild with a slight heat and a hint of bitterness, and is sometimes pickled and sold in jars. In Italy the friggitello is most associated with Tuscany. The Greek variety, which is sweeter, is commonly used elsewhere in Europe and the United States. Like many other cultivars of Capsicum annuum, the friggitello requires a warm climate with a lot of sunlight and is not tolerant of frost. The seeds take 10 to 14 days to germinate, after which the plant will reach maturity in 70 to 80 days. It appreciates slightly rich and well-drained soils, but overfertilized soil will result in fewer fruits. The plant has the potential to grow plenty of fruits, so it requires staking if it is to be prevented from falling over due to the weight of the fruits. The fruits should be harvested when they are 5–7.5 centimetres (2.0–3.0 in) long. Mature fruits will eventually turn red, but it is best to pick them while they are still green. Even though it is often pickled, the friggitello has a complex flavor which is appreciated most when it is eaten fresh. It lends itself very well to sautéing, stuffing and popping. It combines nicely with fruits and is a suitable ingredient to use in salads and compotes or on sandwiches. They are also often served with kebab, such as İskender kebap. Pickled friggitelli can vary in color from bright yellow to bright yellow-green. Sometimes coloring is added. If pickled, friggitelli are sometimes briefly rinsed in cold water before serving to reduce the effects of the pickling brine on the taste. If you’ve never made chili before, you probably have some idea that proper chili should be pretty spicy and you may be tempted to reach for store-bought chili powder. But, you’ll get better results and a truer heat by finding some dried chiles like chipotles, guajillos, anchos, and pasillas, toasting them, and grinding them using a coffee grinder. The Scoville Scale – If you can’t stand the heat…. Pepper stand at market in Texas, with Scoville scale. The Scoville scale is the measurement of the pungency (spicy heat) of chili peppers or other spicy foods as reported in Scoville heat units (SHU), a function of capsaicin concentration. The scale is named after its creator, American pharmacist Wilbur Scoville. His method, devised in 1912, is known as the Scoville Organoleptic Test. Unlike methods based on high-performance liquid chromatography, the Scoville scale is an empirical measurement dependent on the capsaicin sensitivity of testers and so is not a precise or accurate method to measure capsaicinoid concentration. 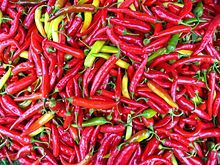 The cayenne pepper, also known as the Guinea spice, cow-horn pepper, aleva, bird pepper, or, especially in its powdered form, red pepper, is a cultivar of Capsicum annuum related to bell peppers, jalapeños, paprika, and others. The Capsicum genus is in the nightshade family (Solanaceae). It is a hot chili pepper used to flavor dishes. It is named for the city of Cayenne in French Guiana. Most cultivated varieties of cayenne, Capsicum annuum, can be grown in a variety of locations and need around 100 days to mature. Peppers prefer warm, moist, nutrient-rich soil in a warm climate. The plants grow to about 2–4 ft (0.6–1 m) in height and should be spaced 3 ft (0.91 m) apart. In gardens, the plants may be planted as close as 1 ft (30 cm) apart in a raised bed. This may reduce the yield of an individual plant, but will increase yields per unit area. Cayenne pepper consumption dilates the blood vessels and speeds the metabolism due to the high amounts of capsaicin. With the consumption of cayenne peppers, the amount of heat the human body puts off is influenced. In animal studies, capsaicin has the ability to boost metabolism, which in turn causes weight loss. This increases circulation and blood flow to all major organs which facilitates oxygen and nutrient delivery. Cayenne pepper may support a healthy energy balance while suppressing appetite. Capsaicin has been shown to increase energy expenditure, so acts as a metabolism booster and is beneficial in long-term weight loss. A correlation has been shown between substrate oxidation and capsaicin. Capsaicin treatment sustained fat oxidation during weight maintenance, but did not affect on weight regain after modest weight loss. In a low-concentration cream applied to the skin, capsaicin has no meaningful effect in helping relieve neuropathic pain; rather, it causes skin irritation. Cayenne is a popular spice in a variety of cuisines. It is employed variously in its fresh form, dried and powdered, and as dried flakes. It is also a key ingredient in a variety of hot sauces, particularly those employing vinegar as a preservative. Cayenne pepper is often spread on sandwiches or similar items to add a spicy flavor. Buffalo wing sauce often contains cayenne. A favorite among Steve and Rachael’s family, thanks for passing it along! Cook pasta according to package directions, preferably al dente (firm to the bite). Drain and keep warm. Meanwhile, in a large skillet cook sausage over medium-high heat, breaking up into bite-sized chunks, until browned; drain fat. Add the bell pepper and cook for about 2 minutes, stirring occasionally. Stir in the beef broth. Bring to boiling; reduce heat. Simmer, uncovered, for 5 minutes. Season to taste with salt and pepper; stir in parsley and the cooked pasta and toss gently to combine. Serve immediately garnished with freshly grated Parmesan cheese. Spent the morning at a local park, just enjoying the beautiful weather. Then the family started our outdoor sprucing up for the rest of the day. For dinner finally got around to the Poblano Peppers, after being distracted by the Rainbow Trout yesterday. For dinner; Baked Stuffed Poblano Peppers w/ Mini Ears of Corn with Chili Lime Butter. I’ve had made Stuffed Jalapeno Peppers but it’s the first time I’ve stuffed the Pablano Peppers. 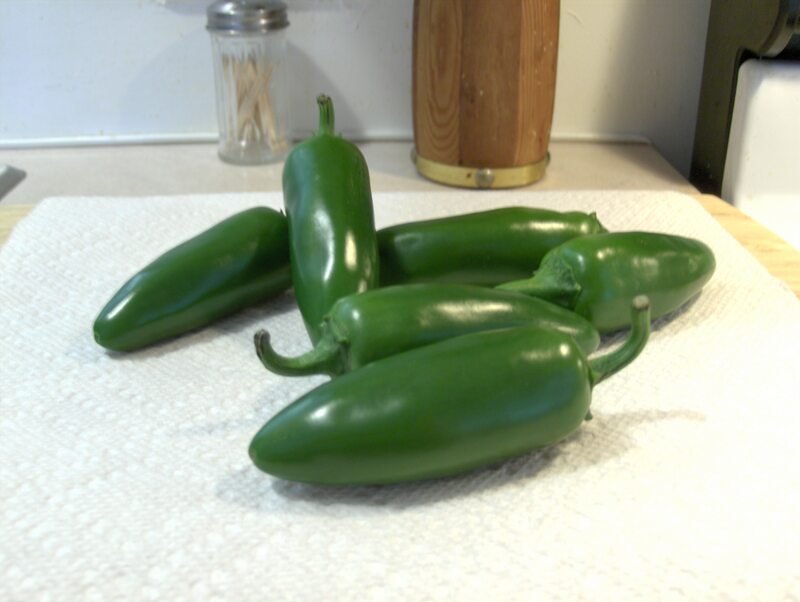 They’re a lot easier to work with than the Jalapenos because their bigger and easier to handle. I started by splitting the Poblano Pepper in half and removed the seeds and ribs. Set them aside and gathered my stuffings for them. To stuff it with I used 1 packet Old El Paso Taco Seasoning, Jennie – O Extra Lean Ground Turkey Breast (120 calories 0 carbs), Uncle Ben’s Whole Grain Medley Brown Rice and Quinoa with Garlic, and fresh grated Dutch Gouda Cheese. I cooked the Ground Turkey ahead of time that way when I stuffed it in the Pepper it wouldn’t take as long when baking. As I fried the Ground Turkey I seasoned with Sea Salt, Ground Black Pepper, Roasted Ground Cumin, along with the Old El Paso Taco Seasoning Packet. After it was done I sit aside until I was ready to use for the Stuffing. The Uncle Ben’s Whole Grain Medley Brown Rice and Quinoa with Garlic was leftover from the other night’s dinner so I just had to reheat it a tad before adding into the Pepper. I also made a Tomato Sauce to top or baste the Pepper in as it was baking. For the Sauce I used 1 8 oz. can of Tomato Sauce and 2 Green Onions that I diced up. In a small sauce pan I added the can of Tomato Sauce and the diced Green Onions and heated on medium heat for about 10 minutes and turned it on low until I was ready to use it. 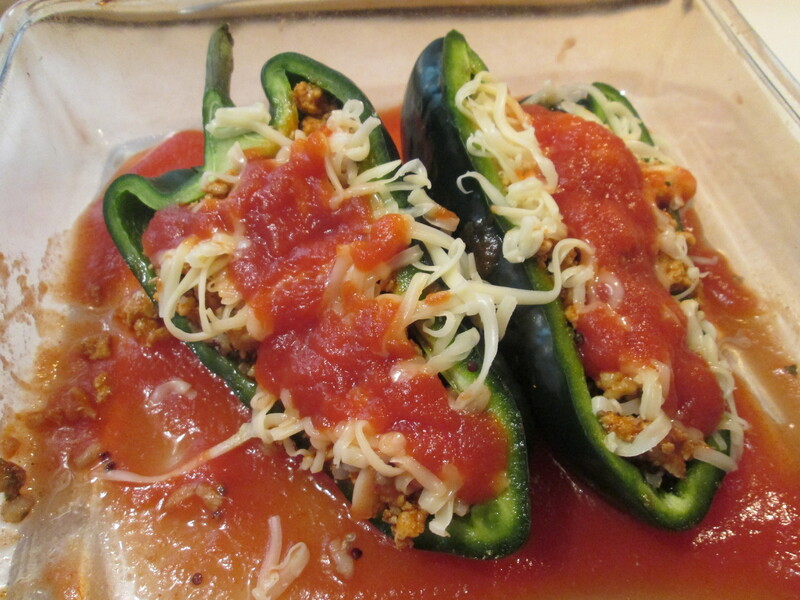 Having everything ready I Stuffed the peppers with the Ground Turkey and the Rice and Quinoa mixture. Ladled about half of the tomato sauce into a 13- by 9-inch casserole dish. Place the peppers on top and ladle over the remaining sauce. Sprinkle the Peppers with the Gouda Cheese, cover the casserole dish with foil and baked for 30 minutes. Removed the foil from the top and cooked until the peppers were very soft, about another 5 minutes. These came out incredible! Half of the Pepper was enough for me. The combination of the Peppers and all the ingredients worked well together to give some fantastic flavor! Have to keep this recipe. I also boiled a couple of Green Giant Mini Ears of Corn that I buttered with a Chili Lime Butter. The Butter is easy to make. Just took I Can’t Believe It’s Not Butter, 1 teaspoon Chili Powder, and zested 1/2 a Lime. Mixed it all together and done. The Stuffed Pepper and Corn makes one fine meal. For dessert later a Healthy Choice Chocolate Swirl Frozen Yogurt. 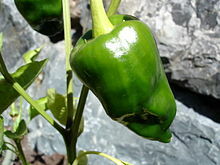 The poblano pepper is a mild chili pepper normally grown in Mexico. Fresh poblano peppers are wide and usually served stuffed. Poblanos have a mild taste like bell peppers. The Scoville Heat Unit is used to determine the level of heat in peppers. The measurement for a poblano pepper is 2,500 to 3,000 units, as compared to cayenne pepper, for instance, which has a heat unit of 35,000. Generally, poblano peppers have the same nutritional components as other chili peppers. Poblano peppers, cooked or raw, are very low in calories and fat. The calorie and fat content does not change when cooked unless cooking oils or butter are added. One cooked poblano pepper has 13 calories. A poblano pepper has well under a half gram of fat, and only a small fraction of that is saturated fat. Poblano peppers do not have cholesterol. Extremely low-calorie foods, such as poblano peppers, make healthy snacks to maintain a low-calorie diet. Cooked poblano peppers are low in carbohydrates. One poblano pepper contains 2.7 grams of carbohydrates, which is only 1 percent of the total daily value. Out of the 2.7 grams of carbohydrates, 1.1 gram is dietary fiber. This represents 4 percent of the recommended daily allowance of fiber. According to the Mayo Clinic, fiber has a number of health benefits, including regulating bowel movements, controlling blood sugar levels, reducing cholesterol and possibly aiding in weight loss.